Blaheta’s response is a working definition of “gaslighting,” itself a verb spawned by Patrick Hamilton’s 1938 Broadway hit Gaslight (also called Angel Street in many US productions). Bella Manningham, the play’s psychologically vulnerable heroine, is subtly manipulated by her suave-but-dastardly husband Jack into doubting what she sees, thinks and feels. Set in 1880s London, the action in Gaslight takes place in the multistory house Bella and Jack have purchased. Items are moved, or hidden, or lost, and Bella, Jack says, is responsible—though she has no memory of it. When the gas-fueled lights seem to flicker and change, but only when Jack is absent and she is alone to see them, she is increasingly fearful that she is losing her mind. In 1940 Gaslight was adapted into a movie; four years later it was remade into the more familiar MGM version starring Charles Boyer and Ingrid Bergman. Indeed, it seems like our entire culture is experiencing a “gaslit” extended-play moment that we witness on the daily news shows—a transformative moment of parallel, non-intersecting streams of information, as Politico’s Susan Glasser told an audience at Longwood University last week. “We live in a post-truth time,” she said, where facts are less important than emotion and personal belief. As if to underscore Glasser’s comments, a recent WUMO cartoon in the Richmond Times-Dispatch featured “Post-Truth Time”: Big Ben’s numberless face reading “The time is what you feel it is.” And finally there’s Stephen Soderbergh’s current movie Unsane. Its heroine moves from one state to another trying to escape a stalker, only to find herself committed to a mental institution. 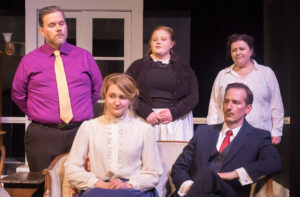 Gaslight runs April 13-14 and 20-21 at 8 p.m. For ticket information, access the Waterworks Players website at http://waterworksplayers.org/buytickets or call (434) 392-3452. 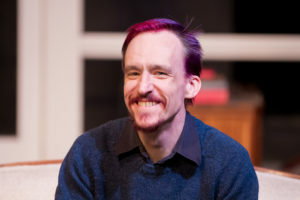 Photographs courtesty of Alec Hosterman.